Highlights new and emerging risks the re/insurance industry expects to face over the next few years. The report looks at 21 emerging risk themes, their potential impact and cascading effects across the industry. The four emerging risks with the highest potential impact are de-globalisation, super natural catastrophes, the "great monetary experiment" and the challenge of the "Internet of Things". Key drivers of the changing risk landscape are new economic, technological, socio-political and environmental developments as well as growing interdependencies. 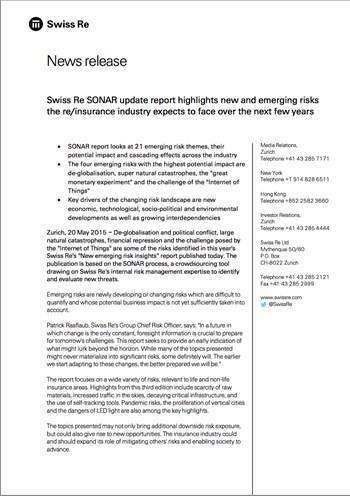 Zurich, 20 May 2015 – De-globalisation and political conflict, large natural catastrophes, financial repression and the challenge posed by the "Internet of Things" are some of the risks identified in this year's Swiss Re's "New emerging risk insights" report published today. The publication is based on the SONAR process, a crowdsourcing tool drawing on Swiss Re's internal risk management expertise to identify and evaluate new threats.